This Halong bay 3 day 2 night excursion on the Gulf of Tonkin explores all of the major highlights of this unique location including Bai Tu Long bay, Vong Vieng floating village, Trong (drum) cave, Lan Ha bay, Van Gia fishing village, Halong bay, Sung Sot (surprise) cave and much more. Enjoy kayaking and swimming in the lucid waters of the bay and a BBQ lunch on on a private beach. 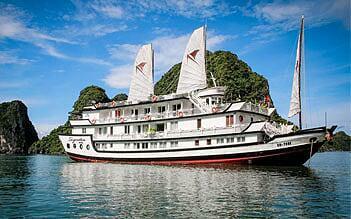 Our Signature Halong Cruise Halong Bay vessel is designed for comfort and service and we have onboard activities to keep everyone entertained. Admire by charm and tranquility beauty lagoon of Halong Bay. Our family of three went to a three-day Signature Cruise on Halong/Bai Tu Long Bay with four friends from France and Belgium. The trip was well coordinated by the Chief Purser, Cuong Lee from the very moment Handspan van delivered us to the Signature Cruise office, Mr Cuong Lee explained to us the process of boarding, tagged our baggage for delivery, accompanied us to the boarding area (a quite crowded place from numerous passengers boarding to the different boats simultaneously). During the boarding process, one elderly member of our group found out that he forgot his cell phone in the office. Mr Cuong Lee arranged for an office employee to bring it back to the boat. Mr Cuong Lee always explained in detail the activities we should expect for the days. Since many travelers did not come from an English-speaking countries, Mr Cuong Lee made a special effort to speak slowly and repeated the message patiently to make sure that everybody understood him. He came to my table to speak to me in Vietnamese since I was born in Vietnam to make sure that I would translate in English and French so that elderly members of our group understood everything. Unfortunately, my daughter who was born in the US did not understand his good intention and complained in the customer review form that he was too repetitive. 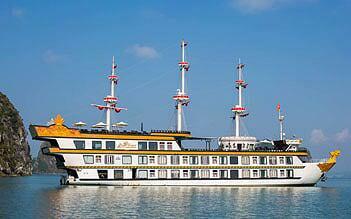 We are very happy we took this trip and plan to go back to Halong Bay with Signature Cruise. The only complain our group have is about food, the European style food was mediocre, but the Vietnamese food was excellent. Mr Cuong Lee told me that had we let him know, he would have made sure that all our food be Vietnamese. Mr Cuong Lee also brought us to the office and called Handspan van driver to pick us up for the return to Hanoi. In summary, we had an excellent experience, and we thank Mr Cuong Lee very much for his efforts to make our trip a very pleasant one. There are people who love cruises and those who don't. Although I fall into the latter category, I was very pleasantly surprised by the experience. 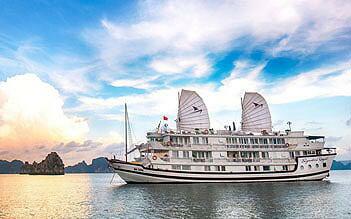 Halong Bay is a place of exceptional beauty, and the cruise was amazing. The room was well appointed with a private balcony and was classic chic, and clean. The journey was smooth and the food that of a high quality restaurant. The staff were all incredibly attentive and welcoming - they really went beyond the pale to make our experience in this magical place so much richer. In particular, Mr Lee (the Chief Purser) who not only saw to our every need, but also spent time making sure passengers traveling alone felt included (Ms River Ha also! We love you River!). The cooking classes, a day trip of kayaking, swimming and relaxing on an isolated beach, with beautiful warm waters are a few of the highlights - the sunsets were glorious! Highly recommended. Me and my partner had an excellent experience here. The service was excellent - would recommend doing the two night cruise as the food is better and it’s worth it! Lee, Iphone and Liam really made our trip excellent and all staff speak great English. Thanks guys! Signature Cruise was truly a memorable experience with my wife. 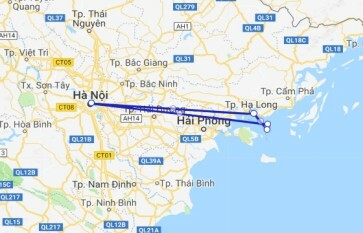 Vietnam is where we decided to take our honeymoon. We booked a 2-night cruise (Senior suite with private balcony) with Signature and don't regret a thing. Our cruise manager was Sarah and she treated us very special even though we did not even tell her/them that it was our honeymoon until the first day of the cruise. Sarah was kind, professional, and personable! The whole trip was amazing; I can't recommend them enough. Me and my husband did the 3 day cruise and I can say that it was remarkable!! We love it every minute , the rooms are very big ( we had the family suite which had a private balcony) super comfortable..The staff was extremely nice ..A special thanks to Sara the manager for making this trip so incredible for us!! HIGHLY RECOMMEND!! !